The traditional migration of adult white sharks southward to the waters of Southern California has occurred, and sightings should begin to rise throughout the spring and into early summer. Signs of their presence? The sharks themselves, and their kills. If you walk or run California beaches between February and July, you may see seal carcasses lying on the sand. Look for signs of shark wounds. These would be gouges made of half-circle teeth marks, missing torso-flesh or complete decapitation. Headless seals are a sign of well-fed white sharks hunting for sport. It's a creepy thought, but it's part of marine life. On the subject of creepy, the sightings and encounters round-up from last year (2010) is noteworthy. 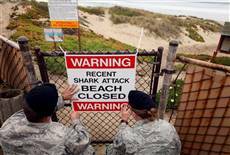 Shark researcher Ralph Collier of Los Angeles reports: "There were 7 authenticated unprovoked shark attacks along the Pacific Coast of North America during 2010. The 7 cases reported for 2010 brings the total number of unprovoked shark attacks occurring along the West Coast during the first decade of 21st century to 56. This is more than five times the 20th-century annual average, and represents [more than half] of the total number of attacks reported for the entire 20th century." Serious news, folks: 56 total unprovoked attacks in just ten years -- more than half of the total for the last 100 years. What does it mean? Sharks are trolling these waters in greater numbers. Sharks are less able to figure out what humans are and are coming closer to take a bite. The loss of visibility in the water is a big player. As the ocean is increasingly stripped of its fish, algae blooms are taking over. Why? Because many fish are plankton/algae feeders and, without fish, there's less that's eating the algae. Red tide is an algae (dynoflagellate) bloom, and red tides have plagued us for many years. In 2010 another algae appeared -- bright green tetraselmis. Though sharks have great vision underwater, they can't see through murk. So they come closer. If they still don't know what something is, they are apt to take a bite. It's a very creepy thought, but it's part of marine life. Read more on our Seals and Sharks page. 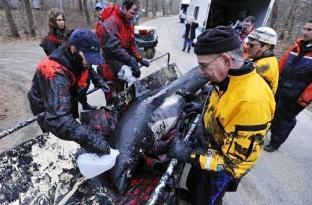 Each year some 1200 to 1600 whales and dolphins are found stranded off the United States coastline. "Stranded" means weak or dead, usually in the water, sometimes on the beach. Isolated from their companions (marine mammals like company) many of these animals are being found without their hearing, which means they can no longer survive in the deep. Quoting a November 2010 article from the science news section of Boston.com, "Researchers are unsure [of] what is causing the hearing loss: It might be old age, birth defects, or a cacophony of man-made noise in the ocean, including Navy sonar, which has been associated with some marine mammal strandings in recent years." Dolphins use sound -- their own signature whistles and rapid frequencies that humans hear as clicks -- to locate each other, food, and to navigate their surroundings. In murky water (which is more and more the case today), dolphins rely heavily on audio frequencies and cannot function without their hearing. "Sound is probably the most important sense they have," says a senior conservation scientist from the Chicago Zoological Society. Rescuing stranded marine mammals also involves rehabilitating them and releasing them back into the wild. But if a dolphin is deaf, it isn't going to be able to make it out there, so it may simply have to be euthanized. The bottlenose dolphin has been found to be particularly vulnerable to hearing injury of late: 4 out of 7 stranded dolphins found stranded in coastal waters could not hear properly. What is interfering with or affecting them in this way? Read more here and see our Navy Warfare Testing page for more on stranded ocean creatures. On October 22, 2010, 19-year-old Lucas Ransom was fatally bitten on his boogie board at Surf Beach in Santa Barbara, California. It was 9 in the morning and he was 100 yards from shore. "It was really fast," said his friend Matthew. "You just saw a red wave and this water is blue -- as blue as it could ever be -- and it was just red, the whole wave. Even the barrel was red." "They're out there," people say. "We're in their territory -- it's just nature." All that is true, but the encounters are more frequent now than ever. Professor Alan Shanks of the Oregon Institute of Marine Biology reminds us that sea lion populations are soaring, and this is what is attracting great whites. The Shark Research Committee in Los Angeles confirms that sightings of sharks on the West Coast have more than tripled in the last couple of years. David Lowden of Coos Bay, Oregon has seen six sharks in the water since 2006, and on September 27th was rammed by a shark while surfing in the area of the Umpqua River and Winchester Bay. 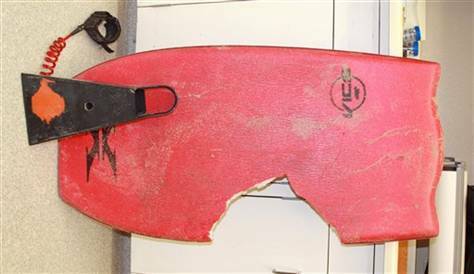 "The shark was at full attack speed, nailing the tail of my board and ejecting me forward as [it] breached the surface with most of its body," Lowden reported. The fins of his board broke off, the shark thrashed the water on its side, and headed back into the deep. Lowden's impression was that it was somewhat confused. The mix of people and sharks may indeed be confusing to both forms of life. The shark/sea-lion relationship is not, however, as it has long been part of the marine food chain. Where the prey is, the predator goes is a central tenet of that environment, and we beach-going humans are simply getting caught in the jaws of it (no pun intended). See our "Seal Problem" page for more. Of note is that in the three attacks referred to above, all involved some type of gear that might have been confusing to the shark. Surfboard, boogie board, and in the case of Dave Martin, a full black wetsuit. All of these, either because of shape or color, suggest the mature shark's preferred food -- the seal, sea lion or pinniped. Definitely see our seal section for more.